Icy rain, wet snow, and brief bursts of sunshine came and went as we searched for signs of polar bears, walruses, and beluga whales along the southeast shore of Devon Island in Canada’s high Arctic. But none of us had considered watching out for obstacles submerged beneath the silty water until we heard—and felt—something slicing through our inflatable. As the 4 °C water began to fill the boat faster than we could bail it out with our one bucket, I instinctively suggested that we get to shore as soon as possible. But the first mate and science officer on this Arctic expedition had another idea. “Keep bailing,” she said as she steered toward our support vessel, now out of sight and more than two kilometers away. It was mid-August in 2012. 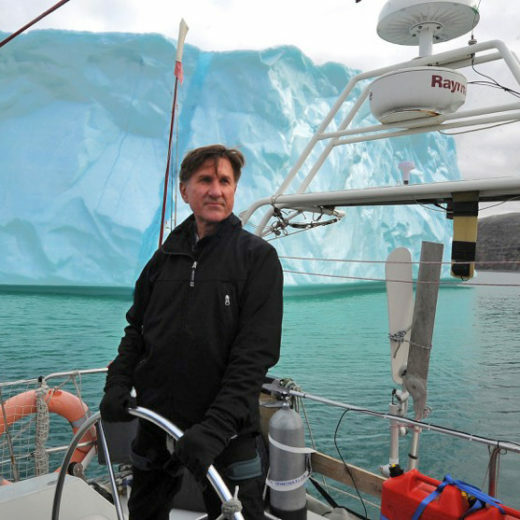 On this third leg of a five-week journey from Greenland to Ellesmere, Coburg, Devon, and Baffin Islands in Canada, there were seven of us—Canadian and French scientists and a New Zealand sailor. Together, we were trying to get a sense of how the Arctic Ocean was responding to climate change, and how that change was affecting marine life so well-adapted to extremely low temperatures, extensive sea ice cover, violent seasonal changes, and punishing variations in salinity driven by ocean currents, fresh water from Arctic rivers, receding glaciers, and melting sea ice. Early as we were into the journey, it was evident to us, and to most scientists conducting research in the Arctic, that there had not been a summer like this one, not even in 2007, when sea ice had retreated to its previous low. News of the repercussions came from many fronts. In northern Greenland, where a sheet of ice at least twice the size of Manhattan had broken away from the Petermann Glacier for the second time in two years, Inuit hunters were killing their dogs because the lack of sea ice limited the hunters’ ability to catch the seals needed to feed them. And the rapidly melting ice was opening up new pathways for southern animals to migrate into Arctic waters. We learned of southern fish far out of their range, and of killer whales—ice-averse animals rarely seen in the Arctic—chasing narwhals and beluga whales off the north coast of Baffin Island. In one case, an Inuit hunter played a short, but heart-stopping, game of tug of war with an orca that made off with a freshly killed narwhal he had harpooned and was hauling in. Now, four years on, mounting evidence makes it clear that the Arctic Ocean, once a slumbering giant covered in thick ice for most of the year, is waking up from its hypothermic state and flexing its newfound energy. It seems clear that this ocean, the world’s smallest and shallowest, is becoming home for wildlife from the south. What remains to be seen is whether this will benefit the Inuit, whose traditional food sources are being battered by climate change, or trigger an international race to exploit emerging resources in the high seas of the central Arctic Ocean. Only eight percent of the region is bound by any international rules under the North East Atlantic Fisheries Commission, leaving the remaining 92 percent open to unregulated commercial fishing. The Great Arctic Cyclone of 2012 was yet another sign of a new Arctic unfolding. Winds generated by storms such as this are expected to occur more frequently as the region heats up. That’s significant because strong winds accelerate the transfer of heat and moisture between the atmosphere and the ocean or the surface of the sea ice. Strong winds also break up sea ice into smaller floes that melt more quickly. That, in turn, disrupts sea ice and ice-edge ecosystems that favor beluga whales, narwhals, and Arctic cod. Arctic cod are key to understanding how climate change is affecting life in the Arctic Ocean. They are small fish that tend to grow to about 30 centimeters in length, sometimes longer, yet they are an important source of food to narwhals, belugas, ringed seals, seabirds, and larger fish such as Arctic char and Greenlandic halibut. And it’s estimated that each year in Lancaster Sound—at the eastern entrance to the Northwest Passage—marine mammals consume 125,000 tonnes of Arctic cod, and seabirds consume an additional 23,000 tonnes. With sea ice retreating, Arctic cod, which favor temperatures below 4 °C, have been migrating even farther north. In their absence, new fish are filling their niches: capelin have supplanted Arctic cod as the main forage fish for seabirds in Hudson Bay; in the Barents Sea, the range of sub-Arctic fish, such as beaked redfish and long rough dab, is shifting northward; and Pacific sand lance, a major food source for many commercially important marine species, now have a foothold in the Beaufort Sea. There have been so many mackerel migrating into Greenlandic waters that the government launched a successful experimental commercial fishery in 2013. Having been on my own on that last day of our stay, I didn’t get a chance to show my colleagues what I had seen. It seemed so improbable for a salmon to come that far that I didn’t think to pursue it. Back home, however, the mystery begged for an answer so I got in touch with Karen Dunmall, a University of Manitoba biologist who has been tracking the movement of all five species of salmon into Canada’s western Arctic in recent years. With the help of indigenous fishermen who report their unusual catches on a Facebook page, or send their frozen samples to her by mail, Dunmall has found that Pacific salmon are migrating thousands of kilometers into the Beaufort Sea and up the Mackenzie River system into Great Bear Lake and the Liard and Slave River systems. The migration of fish and other harvestable marine species into the Arctic could be a boon to Inuit and other indigenous northerners who are struggling with the recent collapse in caribou populations, and the declines of seals, seabirds, and other species. While Greenlanders are capitalizing on the migration of fish such as mackerel into the Arctic, the Inuit of Nunavut continue to exploit fish stocks that are poised to move northward. Nunavut’s harvest of turbot on the southern coast of Baffin Island has more than doubled in value from 2004 to 2014. And in 2013-14, Nunavut’s offshore and inland fisheries created 370 seasonal jobs and had a total market value of CAN $86-million. Looking hopefully at the possibility of fish moving into more northerly Arctic waters, the government of Nunavut recently commissioned the Centre for Fisheries Ecosystems Research at Newfoundland’s Memorial University to spend six years researching the potential for commercial fisheries. A similar study in the Beaufort Sea led by DFO’s Reist is much more advanced. In a survey that was conducted between 2011 and 2015, Reist and his team have found 16 species of fish that may be new to the region. While no one believes that the central Arctic Ocean is ripe for salmon, Greenlandic halibut, and bluefin tuna, Scott Highleyman, director of international Arctic programs for the Pew Charitable Trusts, believes the future may be more fish-friendly than most people think. The central Arctic Ocean has both shallow continental shelves and deep basins that are favorable for fish, he says, and because there are snow crabs and Arctic cod not far away in the Chukchi Sea, it wouldn’t require a long migration for those species to move in. Positive as this potential influx of fish into the Arctic could be, it may prove to be disastrous if the world’s fishing nations try to exploit a potentially emerging resource in a region with murky political boundaries. Nearly all of the central Arctic Ocean, for instance, lies outside the exclusive economic zones of the five coastal Arctic nations: Canada, United States, Russia, Norway, and Denmark (by its connection to Greenland). Aside from the eight percent of international waters governed by the North East Atlantic Fisheries Commission, the central Arctic Ocean is the collective responsibility of all humanity. The idea of a moratorium on fishing has been discussed at high levels for nearly a decade. But it failed to get serious traction until January 2015, when 40 Arctic experts from the United States, Canada, Russia, China, Iceland, Denmark, and Greenland traveled to Tongji University in Shanghai to attend the first Roundtable on Central Arctic Ocean Fisheries Issues. David Benton, a commissioner on the US Arctic Research Commission, quickly interjected with an eye-opener of a story describing how a pollock fishery that the United States was unaware of in the 1980s was being overexploited in a high seas area bordered by Alaska and Russia. A hastily negotiated agreement with Russia in 1993, which was signed by China, Japan, South Korea, and Poland, was remarkable for the fact that it produced the intended results so quickly. But it came too late. According to Benton, the pollock fishery had collapsed, and has not recovered since. The urgency palpable at the Shanghai meeting reinvigorated high-level discussions that had already been underway. Late in the summer of 2015, for instance, the five coastal Arctic nations signed a non-binding declaration prohibiting commercial fishing in the area until science-based international mechanisms, such as a regional fishing management organization, are in place to manage, conserve, and protect stocks with rules, regulations, and sanctions. The big challenge now is finding the best way to move forward. Last December, these five countries, plus China, Japan, South Korea, Iceland, and the European Union, met for the first time to discuss a US proposal for an international fisheries agreement, this one being binding. In March 2016, US President Barack Obama and Canadian Prime Minister Justin Trudeau pledged to work together to support this agreement. And Norway is planning to host a follow-up scientific meeting for October 2016. Whether anything meaningful will come from these meetings remains to be seen. What is clear is that the decades-long trend of extreme Arctic warming hit new heights in the winter of 2015-16, when a mass of exceptionally warm air was pushed into the Arctic by storm-driven systems in the south, raising temperatures by at least 30 °C in some places. At the North Pole, where it would normally be -30 to -40 °C in December, the temperature hovered around the freezing mark. In Svalbard, where polar bears were feeding on white-beaked dolphins for the first time ever the year before, there was almost no ice around to support activity in the most important denning areas. Off the coast of Alaska, more than 8,000 murres starved to death, likely because their prey—capelin, herring, and juvenile pollock—had either dispersed, swam to deeper depths, or disappeared after a massive “blob” of warm water settled into the North Pacific. If the storms that struck the region around that time played a role in the death of the birds, they probably put the birds out of their misery. There was no food in their stomachs when they washed up on shore. It’s not just wildlife that is being affected. As sea ice becomes an increasingly unreliable hunting platform and soaring temperatures alter the life cycles and abundance of prey species, some indigenous communities face worsening food shortages and poor nutrition. In 2015, the US government had to ship in frozen fish to Alaskan communities whose walrus hunts had failed. In northern Greenland, hunters continue to kill their dogs because of their inability to hunt for seals on the sea ice. In Canada, several recent studies suggest that one-third to two-thirds of households in the vast Arctic territory of Nunavut lack access to safe and healthy food. Like most observers, I failed to appreciate how quickly a new Arctic was emerging when I made that trip in the summer of 2012. It was clear that the Arctic that once favored Arctic cod, seals, beluga whales, narwhals, and walruses was being replaced by a new Arctic that may be more suitable for southern fish such as mackerel, tuna, Pacific salmon, and other fish that may, or may not, go a long way toward establishing food security in the Arctic. One memorable moment haunts me to this day. Sailing into Pond Inlet along the north coast of Baffin Island during the first week of September, we should have been presented with freezing temperatures and snowfall. What we got was 10 °C temperatures, rain, and green grass and sedges lining the shoreline. It looked like the north end of northern Scotland on a late summer day, not a place for the polar bears that were nowhere to be seen during our six-week journey. Walking the muddy streets of Pond Inlet, I stopped to talk to one Inuit elder about the weather, the killer whales chasing narwhals, and the ice cover in the region that had retreated to levels that no living Inuit had ever seen before. After pausing for a moment to think, the elder simply shrugged and said, “Our world is changing much too fast for me.” It was as if he was in awe of how the Arctic he was most familiar with was morphing into something completely new. Cite this Article: Edward Struzik “Welcome to the Arctic, Fish,” Hakai Magazine, Aug 16, 2016, accessed April 26th, 2019, https://www.hakaimagazine.com/features/welcome-arctic-fish/.